The winners of the personality awards in The Straits Times and Lianhe Zaobao Best Asian Restaurants Awards were announced on April 3. There are four personality awards - two are new - in this second edition of the annual awards to honour the best in Asian dining in Singapore. The new titles are Special Recognition and Manager of the Year. The Best Asian Restaurants Awards rank restaurants in bronze, silver and gold categories. The judges are The Straits Times' Life editor Tan Hsueh Yun, deputy Life editor Wong Ah Yoke and food correspondent Eunice Quek, as well as Lianhe Zaobao food correspondents Marcus Yeo, Ng Chin Chin and Ng Yimin. Twenty-nine restaurants bagged bronze. The silver and gold winners will be announced at an invitation-only gala reception at the Grand Hyatt Singapore tomorrow. The annual awards are part of a year-long gourmet festival, Asian Masters, which is organised by Sphere Exhibits, a wholly owned subsidiary of Singapore Press Holdings, and food and beverage consultancy Poulose Associates. The Sunday Times speaks to this year's title holders. Red Star Restaurant's founders and master chefs, Sin Leong, 90, and Hooi Kok Wai, 79, who jointly won the Special Recognition award, have no plans to retire and are still actively involved in managing the restaurant they opened in 1974. They started the restaurant together with two other chefs, the late Tham Yui Kai and the late Lau Yoke Pui. Dubbed the Four Heavenly Kings of Singapore's culinary scene in the 1960s and 1970s, they were known for concocting a more elaborate festive version of yusheng in 1964. The four men were apprentices at Cathay Restaurant under master chef Luo Chen, whom Sin and Hooi credit for giving them a solid foundation in Chinese cooking. Hooi says in Mandarin: "Not every master chef was willing to teach everything he knew to his disciples, but our master was different." After Luo died, Sin and Hooi left Cathay Restaurant. Sin says: "It was our master's wish for us to have our own restaurants." In 1962, Sin opened the Sin Leong Chinese Cooking Institute in Aljunied Road. He also opened Sin Leong Restaurant in MacPherson, which later moved to Marine Parade. One of his signature dishes is roast USA Duck. Hooi opened his first Dragon Phoenix restaurant in Tanjong Pagar in 1963 and made his name with a signature dish of yam ring basket, among others. In 1972, he asked Sin, Tham and Lau to join him to start the Red Ruby Restaurant, and then the Red Star Restaurant in 1974. Red Star, which can seat about 900 people, has not undergone any major renovations since it opened and looks largely the same. Hooi says: "Our customers asked us not to change the ambience of the place because it allows them to relive happy memories or enjoy the old-school feel." Its facade may not have changed much, but the restaurant has kept up with the times, modernising the kitchen and using less oil, salt and sugar in its recipes. Sin says: "We want to preserve the heritage of Chinese cuisine, but this does not mean we carry on doing things the same way. We have to strike a balance between upholding tradition and evolving to stay relevant in the F&B industry." Chef-restaurateur Violet Oon has had multiple roles including as critic, author, publisher, speaker, teacher, television presenter and consultant. Her efforts to curate, preserve and elevate Singapore cuisine were recognised with her win of two Lifetime Achievement awards in a week. On April 3, she was named the recipient of the Lifetime Achievement Award in the Best Asian Restaurants Awards. The same day, she attended the World Gourmet Summit Awards of Excellence where she picked up the Lifetime Achievement Award under the Highest Honours category. "I cannot believe I got two lifetime awards in one week. Maybe it is because I am older and have been around for so long. I am grateful for the acknowledgement of my quest and passion," she says. "I am going to be 69 next month, but the awards inspire and spur me on to delve deeper into Singapore's rich food heritage." Ms Oon credits her awards to her two children, Tay Su-Lyn and Tay Yiming, who partnered her to open Violet Oon's Kitchen in Bukit Timah in 2012, and business partner Manoj Murjani, chairman of Group MMM, which does investments and acquisitions. Mr Manoj became a partner after dining at Violet Oon's Kitchen, which was subsequently relaunched as Violet Oon Singapore. Despite suffering a stroke in 2014, she opened National Kitchen by Violet Oon at the National Gallery Singapore in November 2015 and Violet Oon Satay Bar & Grill in Clarke Quay last year. Her career in food took off in 1974 when she was a journalist and tasked by an editor to start a food column in The New Nation. She later wrote three cook books. 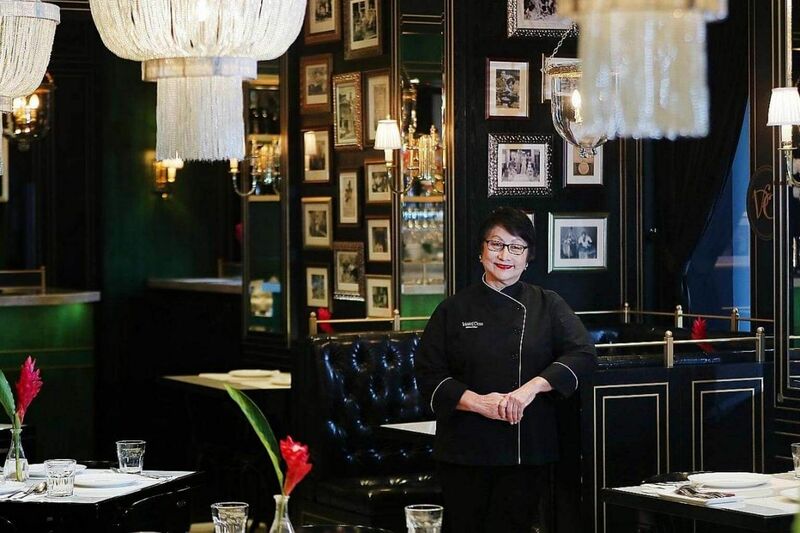 In 1993, she opened her first Peranakan restaurant in Bukit Pasoh Road, after which she ran several cafes and a take-out outlet at Takashimaya. Her F&B outlets closed by the late 1990s and she went into food consultancy. "There were tough times, but I had supportive friends who helped me. I don't dwell on the past. I look at the problem, find ways to solve it and move forward," she says. Retirement is not a consideration as she intends to write a book about her life experiences and more on food. There are also plans to grow the business overseas. "A lifetime achievement award doesn't mean it is time to stop. There is a responsibility to live up to the award and I have to achieve more." When she left Malacca and came to Singapore to look for a job, Ms Irene Yue, then 16, already knew she wanted a job in the food and beverage industry. Now 62, she is the manager at Hua Ting Restaurant. Her first job was as a waitress at a Cantonese restaurant and she worked her way up to become a manager at 28. 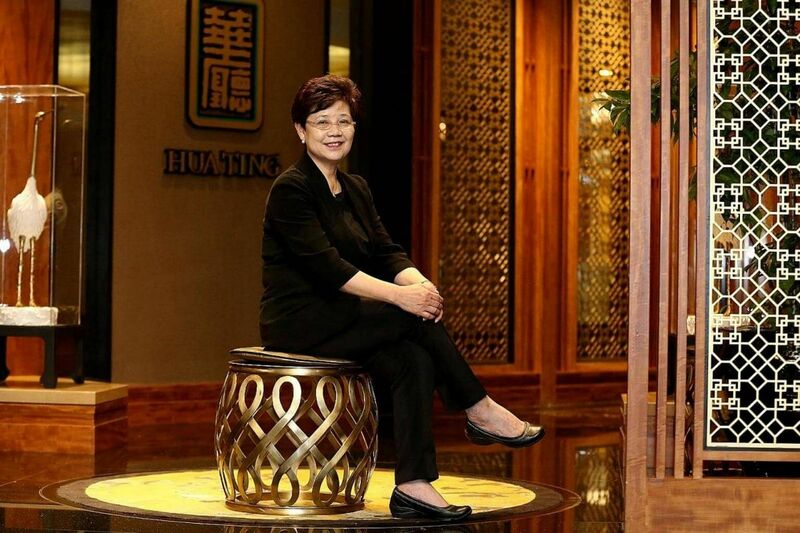 She joined Hua Ting in 2002 and her excellence in service and restaurant operations won her the Manager of the Year Award given out for the first time in the Best Asian Restaurant Awards. Ms Yue says: "I am very honoured and excited about the award. I could not have won it without the strong teamwork of my colleagues and the support of our customers and management." Her predecessors at Hua Ting were Peach Garden founders and current general managers Veronica Tan and Angela Ho. "They were both on the pioneering team and had set the bar high. I needed to keep the service standard high as well as take it to the next level," she says. With the experience she had accumulated by then, she set about to grow the pool of existing customers and attract more regulars. "It is in the little details, such as remembering whether someone likes his tea hot or cool and, if he drinks, whether he like his whisky on the rocks and how many cubes of ice he wants," Ms Yue says. With Hua Ting's multimillion-dollar makeover last year, Ms Yue also worked with her team to raise service levels. After over four decades of industry experience, she says it is important to keep an open mind and keep learning on the job. "Consumers are growing more sophisticated in taste. When they tell me about interesting ingredients or dishes they have eaten elsewhere, I pay attention," she says. She views this as one way to know the changing tastes of her customers while gathering ideas for new dishes. She also shares such information with the chefs and provides them customers' feedback to help them plan new dishes. "Teamwork is important to give customers the best dining experience our customers. "The satisfaction for me is to see the contented smiles on our customers' faces and know that they enjoyed themselves," she says. The title of Chef of the Year is a timely win to mark the 30th year of this sushi master's career. Master chef Koichiro Oshino, 48, of Shinji by Kanesaka at Carlton Hotel, was only 10 when he was inspired by his friend's father, a sushi chef. 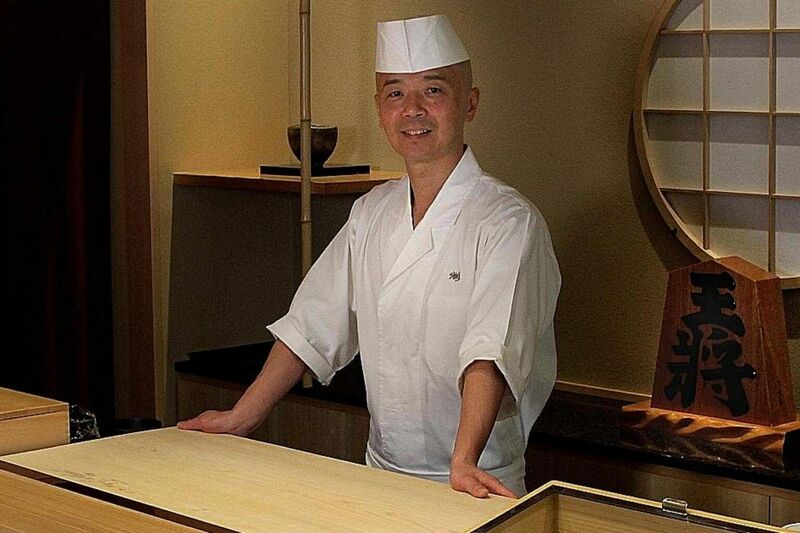 Chef Oshino says: "I was impressed at how he moved with elegance as he prepared the sushi." After leaving high school at 18, chef Oshino told his father about his plan to be a sushi chef. His supportive parents even accompanied him to Tokyo for an interview at renowned sushi restaurant Kyubey. He was hired as an apprentice and worked his way up. In the early 1990s, he was sent to work in a Japanese sushi restaurant in Amsterdam. He worked there for three years and enjoyed his overseas experience tremendously. "I got to learn about European food and local ingredients. I had to learn how to prepare sushi using fish available there. "Having to adapt to the environment and types of fish I was not familiar with made me think on my feet," he says. To be a sushi chef, he believes one must truly love sushi. In 2009, chef Shinji Kanesaka offered him the master chef position for his first overseas restaurant. The two men had met when they worked at Kyubey. Chef Oshino arrived in Singapore in June 2010 to be master chef at Shinji by Kanesaka, which opened at Raffles Hotel. The restaurant relocated to its present location at Carlton Hotel last March. Apart from passion and culinary skills, he says a sushi chef must engage with customers, verbally or otherwise. "Even if customers don't say it, you can tell from their facial expressions whether they like an item. By engaging the customers, I can find out their preferences." For regulars, he used to keep written notes on their preferences, but since 2013, he has challenged himself to memorise them. He also enjoys the opportunity to educate customers, such as not eating ginger slices with their sushi. They are meant to be eaten as a palate cleanser between different sushi. Ms Joni Ong, 57, managing director of Shinji by Kanesaka at Carlton Hotel and also of the one at St Regis Singapore, says: "Master chef Oshino is deserving of this award as he has proven himself a true shokunin - a sushi artisan who has a drive for perfection balanced with passion and diligence."